Interior Designers tell us the beautiful warm colors of yellow and orange go well together. You only need to look at the coastal poppies to know that. Perhaps these colors which call spring out of the earth and us also bring their own balm of healing. 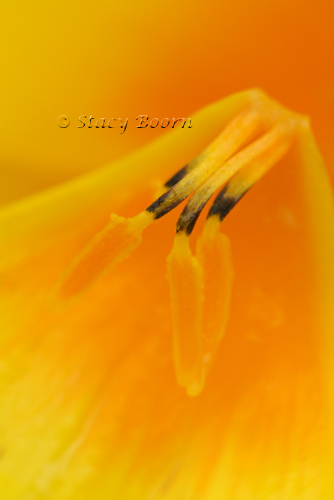 Yellow and orange seem to have a special nature that signals both comfort and vibrant emotions. It is perhaps the power of these colors that speaks to my heart most on this day, one year to the date, of the earth quake and tsunami in Japan. Here this is still much needed restoration, rebuilding and rebirthing. May the power of the orange and yellow be a symbol of our solidarity with those still mourning and remembering their lost loved ones, devastated properties and destroyed livelihoods. So I offer these image of the coastal poppies and their own magical properties to the memory of those 20,000 lost last year, swept into the sea. Although you can find some poppies blooming somewhere all year long in California, this time of year in the Bay Area you begin to see them more plentiful coast side and urban street side. They even have their own song. Growing from the mountains, to the Golden Gate. Flower of the hillside, flower of the plain. 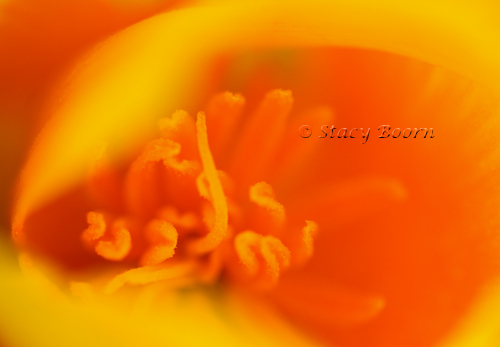 For some years I felt a little intimidated trying to make poppies one of my main focuses. After all I was living in the same state with the poppy photographer par-excellence. Although George Lepp no longer resides in California his legacy of poppy photography is still in the very air we breathe. But after learning many techniques from George Lepp I am finally confident that I have my own vision of the art of the poppy. The images I am sharing from this past week were taken at Kehoe Beach in Point Reyes National Seashore where you can usually find some of the first of the wildflower shows. They weren’t quite there yet, although some lovely individual blossoms and groups of coast poppies were prominent. 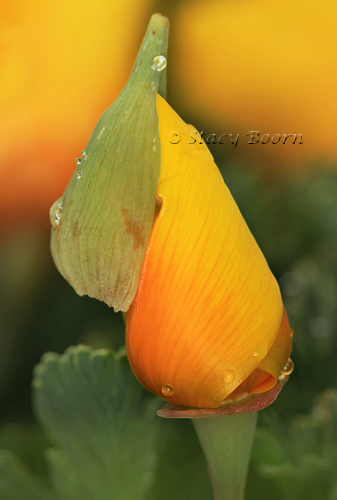 While the California Poppy is one shade of orange the coastal are both yellow and orange. Wanting to just capture the feel of the colors I choose to get in close using a 100mm macro lens and a shallow depth of field so only a small selection of the composition was in focus. The wind usually blows pretty strongly in this location even early in the morning. So using a shallow depth of field (here 2.8) you can obtain a pretty fast shutter speed. You just have to be careful that the intended point of focus is not blown out of its position. Although I advocate for using your tripod, I went off it so I could rock back and forth, even moving with the breeze, until my narrow focused area was right on. I love how the ends of the petals go quickly out of focus at this aperture. Mere splashes of color engulfed me from lens to heart and back again. Yellow and Orange remind me of the painting “Mother and Daughter” by Meinrad Craighead. It is on the cover of her book “The Mother Songs -Images of God the Mother.” It may be more red and yellow, because the shared fruit between the mother and daughter is a pomegranate, but nonetheless the two looking eye to eye have the comfort and challenge that the yellow and orange need to bring to us this day.